Luigi Kasimir was an Austrian-born painter and printmaker, born in 1881, who was one of the first artists to use a technique called colored etching. 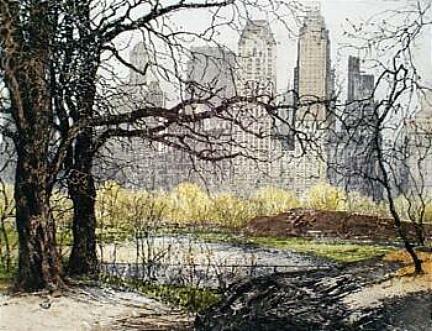 In the mid-20th century he came to the U.S. to etch famous sites, including the bridges, skyscrapers, and parks of New York. This entry was posted on January 20, 2009 at 6:05 am and is filed under Brooklyn, central park, Music, art, theater. You can follow any responses to this entry through the RSS 2.0 feed. You can leave a response, or trackback from your own site. I really enjoy your beautiful works. I don’t know exactly what “color etching” is, but it comes out great. I do high definition etching on glass and mirrror, but your color etching is quite unique. These are beautiful. Do you know where one could see the originals? We have many. Come look! Aside from some museums in Europe, I don’t know where the original etchings can be seen. I tried to find out if any galleries or museums in New York have them, but nothing came up. I want to comment that the presentation of the family Kasimir, unfortunately, is not complete. Missing a key player of artistic development of members of the family Kasimir – father Alois and his works of art – early etching-lithography. If you are truly interested I have several of the color etchings by Luigi Kasimir including Brooklyn Bridge (1927) and Fulton Fish Market. I am going to be listing 2 original, pencil signed, dated and numbered Luigi Kasimir prints on ebay soon. One print is of New York, Governors Island and the other is The MInaret, 5th Ave.
We have quite a few of them that are part of a large artist-signed collection of Kasimir etchings. They is a large collection of Luigi Kasimirs work at the Fine Arts Museums of San Francisco, for both viewing and sale. I actually have a signed original, “The Freiberg” that I intend to sell some time in the near future. I have available for sale several colored etchings by Luigi Kasimir including Brooklyn Bridge (1927) and Fulton Fish Market. I have a number of NEW YORK SCENES (only) original signed Kasimir colored etchings available for sale. I have a document I can send that lists all the ones that I own. If you’re interested, e-mail me. I have some original signed Luigi Kasimir etchings, if anyone is interested. I am selling them. Please contact me at acsipes@gmail.com. I have for sale two of Luigi Kasimir’s signed etchings. One is of Independence Hall in Philadelphia. Framed 21 X 26 inches.. Actual image size is 13 1/2 X 17 1/2 inches.. Also for sale, a Luigi Kasimir small signed etching of an European landscape, image size 2 1/2 X 4 3/8, framed at 10 X 12 inches Both etchings are in excellent condition…. and lovely. I have for sale an original pencil sign Luigi Kasimir 1927 “Brooklyn Bridge”in excellent condition. Museum framed in 1930’s 0r 40’s with Kennedy Gallery label taped on back by framer verifying Original signed Kasimir. Frame 27″ X 22 1/2″ image 16 1/2″ 11”. selling. Below is a list of the etchings, sizes and signature type. All etchings are framed and in very good condition. I’m hoping someone might be able to direct me as how I go about selling them. Do you still have your original signed Vienna Opera House? If so, what are you asking? hi i have an original signed Luigi Kasimir Etching, 1925 of the Golden Gate Bridge from Telegraph Hill. Wondering if anyone can help me determine its value? I would like to sell it on Ebay possibly. 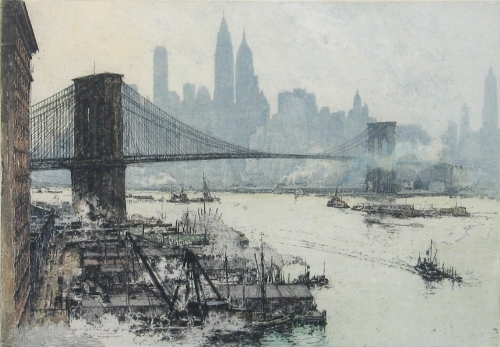 In June of 2013 I sold my original signed Luigi Kasimir etching of the Brooklyn Bridge at auction in the Baltimore area for $425 and unfortunately after my June sale I saw that previously in March, 2013 a similar Brooklyn Bridge etching had sold in New York for $2000, don’t remember name of auctioneer.